My introduction to Agrelia’s Castle was their title track “Elders & Ancestors.” It was featured on Rate The Tracks and made quite an impression on me. When I found out the story behind the music it became even more powerful of an experience for me. 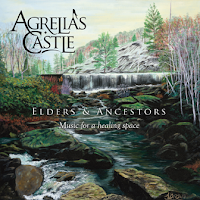 The songs on Elders & Ancestors have grown from the journey of Paul and April Brown together through the challenges of cancer. They come from the desire to create peace, joy, and hope. In that creative experience in music that was the final outcome. I believe many people can benefit from a life’s journey translated through sounds. The couple combines the sounds of a vintage Fender Rhodes B3, sounds of nature, and beautiful angelic vocals. The vocals are indeed heaven sent from the heart of the giver directly to the recipient. Also there are Native American style flutes, guitars, cello, and sitar. They are very earthy tones and inviting sounds to pull in the listener. In this amazing life it takes the people dealing with the most adversity at times to create exceptional beauty through their artistry. This is a case when those of us more fortunate become grateful and more appreciative for what we have. “Breathe” is a superbly layered presentation of instruments and vocals. The sitar, percussion and vocals have a mystical element that is simply mesmerizing and comforting. The act that gives life, breathing, takes on an entirely different meaning through this song. Middle Eastern influences permeate the essence of this track and it is like talking a walk through a vast desert of emotion that heals and renews your soul. “Spirit Dreaming” is another track that just took me away to another place, a safe haven for the heart, body and soul. I feel blessed to have the opportunity for this music to enter my life and give me some solace. Every fear and worry just melts away while listening to this. This particular track features the flute and it gets one in touch with the connection humans have with mother earth and all her wondrous gifts. Music has always been a spiritual experience for me regardless of the genre. This type of music takes that feeling to another level entirely. Look at the cover of this album and you will get an idea of the places the music can take you. The combinations of what surrounds us in nature and instruments made from the earth becomes one breathing and living entity that invites you in and never lets you go. I did not want this recording to end as it gave me such peace and contentment, the kind one feels when the stars align and all is right in the world. Enter Agrelia’s Castle and I promise you will never want to leave. The song “Sonnet” delivers a profound message about how life is just time passing by and how it’s just “you and I,” referring to one’s soul mate whether human or one with four legs, it does not matter. I know when I look in my dog’s eyes I see love, purity and the essence of who we are and what we were meant to be. The love of that creature has no bounds or expectations, it’s unconditional. We all can learn a lot from them. This music inspires, heals, and creates visions and reminders of who we are or what we can be. The Brown’s have created a masterful presentation of nature and music that is certain to move you in some way and give you a renewed perspective of your existence on this planet.